This is a regular Novus Ordo mass: it is nothing out of the ordinary, not even the use of a "stealth priestess" (that is, a vested female EMHC), or special guests in the sanctuary. Liturgically, that is, it is nothing out of the ordinary ordinariness of the ordinary rite almost everywhere: this is it; we know that there are a dozen or so new masses around the world celebrated in order to look like the Traditional Latin Mass, but they do not "herald" any change, alas, despite the fervent wishes of their promoters. 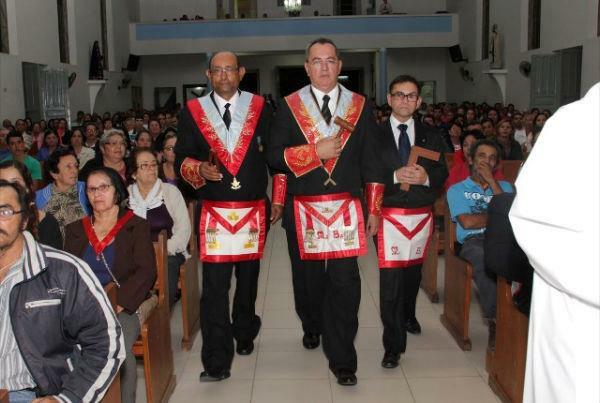 What makes this mass noteworthy, therefore, is the occasion: it is a memorial new mass for the "Day of the Freemason", celebrated by Father Geraldo de Magela Silva, of the Diocese of Pesqueira (state of Pernambuco, Brazil), on August 20, 2012. Its images were actually posted on the Facebook page of a Masonic organization. Excommunicates in the sanctuary. Lovely. Water and oil is the 'symbiotic' relationship created by Vatican II! There is no practicing Catholics here. I do not find these things surprising. For the love of God the Father Almighty: the new mass is named the "Novus Ordo!" The alleged-masons who created the Novus Ordo went so far as to name it after one of the goals of masonry, a "Novus Ordo Seclorum." Not to worry! After all, this Father Geraldo Magela da Silva is in "full communion." Wonderful! Not to worry! 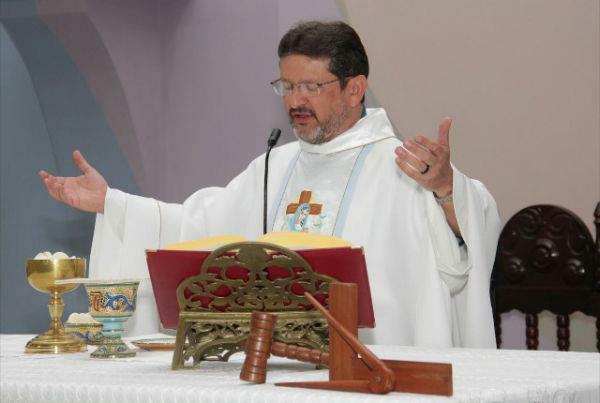 After all, this Father Geraldo Magela da Silva is in "full communion." Wonderful!" Not at least until the excommunication is lifted. Freemasons are the implacable enemy of the Catholic Church. Very strong in Latin America, and in the USA too. As sickening as this is to traditional Catholics like us this is the "fruits" of the "New Springtime" created at Vatican II. This garbage has been going on since the council, yet many of the freemasons and the modernists inside the Church must now feel that these sacrileges' will be accepted by most of the indoctrinated Vatican II flock under the guise of "ecumenism" and inter-religious dialogue. Nothing will be done to these people by the local bishop or by Rome. While the FSSPX remain "outside" the Catholic Church these heretics continue to live out and spread their modernist and relativist abominations against the Catholic faith. Yes, the world and the Catholic Church (one in the same now since Vatican II) are upside down. St. Louis IX pray for us. But ... do these mass participants support the teachings of Vatican II? After all, isn't that the "new" criteria? Would be interesting to see what these same Masons would say to a request by a Catholic to go into his Masonic Hall and hold up a Crucifix before them all. John Paul II removed the excommunications for Freemasonry with the promulgation of the 1983 Code of Canon Law. Just a reminder. The word, yes., but the ban is wrapped up in this: "A person who joins an association which plots against the Church is to be punished with a just penalty; one who promotes or takes office in such an association is to be punished with an interdict." Numerous clarifications, even from JPII, have clarified this after '83. No, they didn't. It is usually those who criticise or reject the novus (new) Ordo Missae of the Missale Romanum who name it the "Novus Ordo." The alleged Masons who crafted the new Ordo Missae did not dub it "the Novus Ordo." They simply called the "Ordo Missae." Also, as others have pointed out, John Paul II did not remove the excommunication for Freemasonry. Catholics who become Freemasons are still subject to punishment. None of which means, of course, that this "Freemason" Mass is anything but the most horrendous sacrilege and mockery of God and the Faith. Why are the members of the SSPX treated as pariahs when both covert and overt Freemasons run rampant in the Church? Holy Mary, Mother of God, help us all! Its Our Lady's warning at La Salette coming true. She has warned us many times, but no one wants to listen. Our Lady is much more deeply saddened about this sort of thing than we could ever be. She will save the Church after we have been justly chastised. Our Lady will come to save the Church sooner than we deserve. While it is commendable to remind us what goes on in the modern church, frequently dysfunctional and totally un-Catholic, it has to be remembered that without papal complicity none of this would be possible. Look to the last three main pontificates for all the necessary factual evidence and you will find it. Otherwise you are merely burying your head in the sand alongside the majority of modern churchgoers who do not want to know. The Popes can never remove the free will of those in the Church. I can be obedient; I can't make others be. You simply have zero idea how much these Popes suffered for the sins of Catholics who abused their freedom. Even Paul VI, and I'm no fan, suffered over priestly defections. Vatican Double does not "teach". It was not given authority to teach. It merely repeats previous teaching. Unless of course it is something of their own invention or twists authentic Teaching which of course would be EVIL and therefore rejected by CATHOLICS. Disgusting and a sacrilege and yet not a surprise. Most sad and disturbing to put it most mildly. What I really want to say I will not say. But this priest and his bishop should fear for their souls. Perhaps, just perhaps, a so called "reconciliation" of the SSPX with Rome should be deferred to a future, hopefully better, time. What will the Holy Father have to say about this? Can't hear him. Too many crickets chirping. They've got their hands out asking for your soul. If Buddha can be worshipped in a Catholic Church, why not a Freemason? The VII Church is in continuity with Tradition after all. The condemnation of Freemasonry lasts. From the "In Eminenti" of Pope Clement XII to the "Declaration on Masonic Associations" issued by the CDF under then-Cardinal Ratzinger, we can see that this is not right. The prohibition is still valid, and it shall always be valid. Has anyone actually made a formal complaint to the CDF about this? 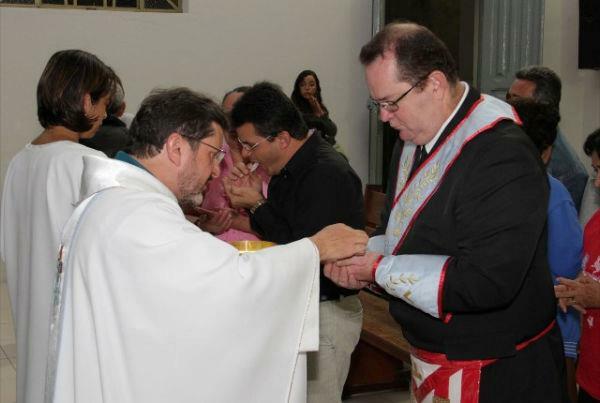 A Catholic priest giving Holy Communion to a Mason ? A Mason approaching a Catholic priest to ask for Communion ? The whole thing is absurd. You cannot be a Catholic and a Mason. Catholicism and Feemasonry are incompatible. You can be one or the other, but not both. A Modernist might say he doesn't understand this. Well, in that case he quite simply has mental dry rot. Christ said : "No man can serve two masters" (Matt.6; 24. There's the answer to the Modernist. It is what Christ himself said. In my surrounding area I have observed especially neo-con prelates (progressists considerably make less effort in this cause given their scepticism against all sort of elitism) with tendency to please devilish masonry. No surprise they lead the conciliar church to the ultimate abyss. 1Membership in the Masons is still forbidden. The declaration "Quaesitum est" issued by the Congregation for the Doctrine of the Faith says: "The faithful, who enroll in Masonic associations are in a state of grave sin and may not receive Holy Communion." "Quaesitum est" was issued on November 26, 1983. The new Code of Canon Law came into effect on November 27, 1983. The main architect of the Novus Ordo was Mgr Bugnini. When PaulVI was given obvious proofs that Bugnini actually was a freemason, he dismissed him and exiled him as nuncio in Tehran. But Paul VI enforced the NO anyways. Who is to be blamed? Paul VI or Bugnini? The Chastisement will come sooner than we think.